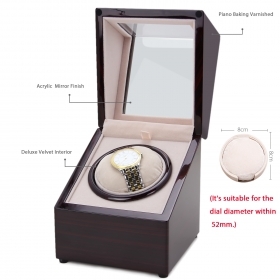 Pure Handmade Wooden Made: piano baking varnished watch winder box with brilliant finishing and luxurious design, high-quality solid wooden made. The high-gloss lacquer finish case has an elegant unique look and solid quality. Keeping the Watch Wound: mabuchi motor with broad range speed setting is quiet and long lasting running with no noise. 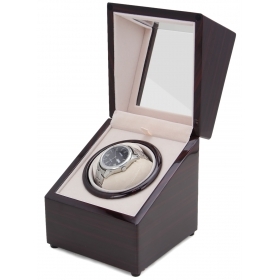 Larger Interior Space: acrylic glass window showcase your elegant watch while the box is winding. Maximum space avoid to scratch and touch. Broad Range of Watch Size: adjustable 80mm pillow can hold all the different size women and men watches and straps. Through rotating a pedestal, a small Japanese motor holds the automatic watch. Watch winder emulate arm movement method by rotating the watch to keep it running. 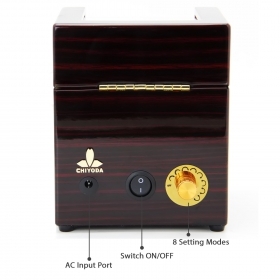 New version of single watch winder has 8 optional speed modes to fit for almost 98% automatic watch. Operated by either 100-120v AC Adapter(included) or 2* 1.5V Battery (not included), MABUCHI Motor offers extremely quiet and stable running for day and night use. You'll be surprised by the silence and longevity of the motor. Especially fit for watches from 20mm to 54mm dial, 80mm diameters adjustable pillow can hold men, women straps and different sizes watch to avoid scratching issue. Anti-static treatment is done for motor & circuit board, insulated velvet decoration is used for the interior to eliminate magnetization and harm to valuable watches. 18 months warranty, and lifetime technical support. 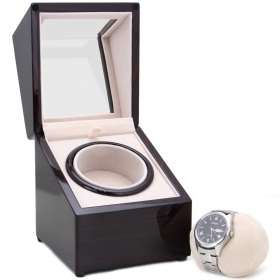 We will help you prolong your CHIYODA watch winder operation time by kinds of customer service and warm tips. We are always standing behind our products to satisfy your need.